The city said it had no immediate plans or a timetable to add Citi Bike stations into Staten Island or The Bronx. Elected officials pitched a proposal to add public funding to the program to help it expand to every neighborhood. NEW YORK CITY — The city has no plans to expand Citi Bike into Staten Island or The Bronx anytime soon — even though operators have already put hundreds of docks in New Jersey. Department of Transportation officials said at a City Council meeting Monday there was no timetable to extend into the two boroughs, which don't have a single docking station. Councilman Ydanis Rodriguez pitched a plan to add public funding to the system that would help expand it into new neighborhoods. “Working, middle and upper class communities should have the ability to enjoy this resource equally,” Rodriguez said at the meeting, according to AM New York. Rodriguez said public money should be used to get the bikes in every neighborhood by 2020. But DOT Commissioner Polly Trottenberg said that placing the stations in less accessible places makes it difficult for workers to distribute and maintain bikes. "I'd hate to have us be in far-flung areas and we can never get the bikes there and people aren't getting the quality of service that we want them to have," said Trottenberg at the meeting, according to the Staten Island Advance. "But Staten Island probably would be an example of, likely, its own system unless we can at some point prevail on the MTA to put a bike lane on the Verrazano Bridge and then you'd have that." 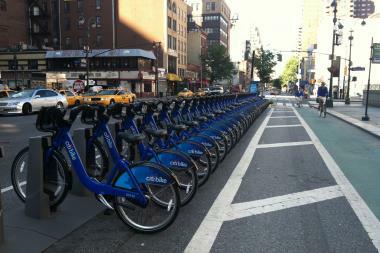 The DOT handles the planning for the bike-share system which is run by a privately-funded company called Motivate. The DOT does not have involvement in the Jersey City operation. Citi Bike was criticized last year after stations were added in Jersey City, yet city boroughs were left unserviced. Jersey City would have the same issues with connections to the city that Trottenberg said Staten Island has. "It is deplorable that Citi Bike is expanding to New Jersey before the rest of the city," Bronx Borough President Ruben Diaz said in 2015. "My borough deserves better, as do the parts of Manhattan, Brooklyn, Queens and Staten Island that are not currently served by our city’s official bike share program." Also in 2015, Staten Island Borough President James Oddo wrote in a letter that, with the New York Wheel and other large developments headed to the borough's North Shore, the neighborhood needs Citi Bike to help tourists and residents get around. Later that year, Mayor Bill de Blasio said that the program needs to expand into Staten Island "as soon as possible."